These model ships turn up in the Finger Lakes due to the tourism between Ontario, Quebec and Central New York. Our grandparents and parents spent some time vacationing in Canada, especially during prohibition. There used to be an easy ferry service between Rochester, NY and Cobourg, ON. My parents Charles and Alice Taylor Sutton honeymooned in Quebec, drove up from their homes in Rochester, NY in June of 1939 and went up along the St. Lawrence and then around the Gaspe peninsula and back. They picked up some things along the way and I heard little bits about the trip when growing up. 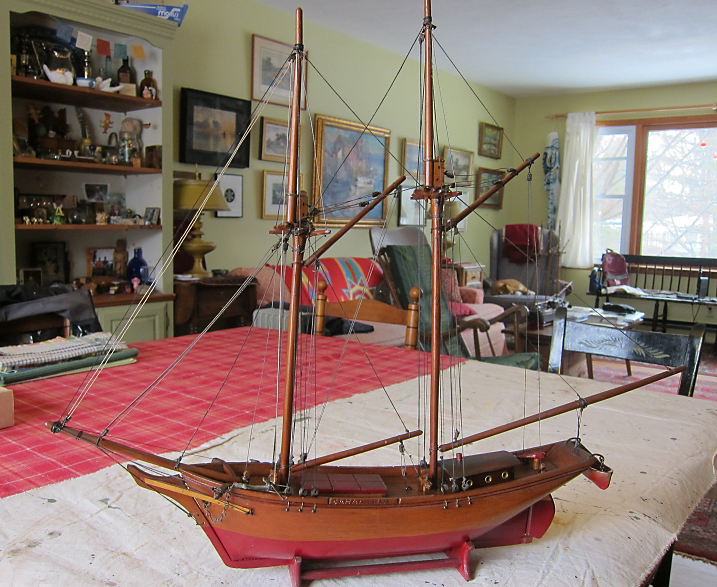 They purchased a wooden model ship along the way Canadienne and it was displayed on the mantle while I was growing up. There was also an inscription carved into the bow that I couldn’t make out. When my father was in his 80’s and living in a retirement home in Rochester I noticed the rigging breaking and fraying and offered to restore it for him. The inscription appeared to read “A Lec Erc”? I have been restoring a few ship models this winter that come in as referrals from West Lake Conservators and in January I was shown a model that was obviously made by the same person (family) who made my parent’s. It is a larger model and when I started working on it I found it inscribed “E. Leclerc” on the bow and Tadousac along the side. With that I was able to decipher the inscription on the bow of my smaller two masted ship as “A. Leclerc” and I found the information on the family published by Lyle Elder at his gallery of Canadian Folk art – Lyle Elder Folk Art.